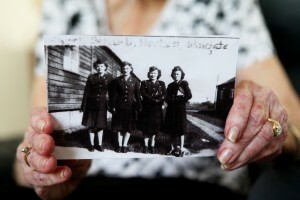 Vida Shapanus watched U.S. planes fly through the night to Normandy, France, for the D-Day Invasion on June 6, 1944. 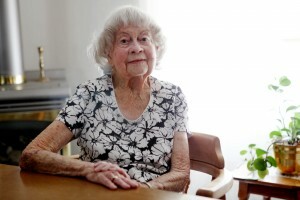 She was serving as an American military nurse in the British Isles during World War II. Although there were rumors around the base of a U.S. invasion coming, she didn’t know where the planes had been going at the time. Vida Shapanus, far right, and friends during their World War II deployment in Wales. Two days after D-Day, Vida started treating soldiers from the invasion who had been stabilized in field hospitals and sent to her base in Wales. Now, the 93-year-old Poulsbo resident is looking to print a book about her military service experience, including the night of D-Day planes. Vida is searching for a professional editor, graphic artist and publisher to help finish the book, said her oldest daughter, Joanna Shapanus. Vida grew up in Fresno, California, where she graduated from nursing school in 1943 before joining the Air Force as a nurse. She has lived in Kitsap County since 1990. She met her husband Tony Shapanus, who died Oct. 20, 1998, during basic training. They kept in contact through letters as friends during the war and started dating once she returned to the states. They have four children, six grandchildren and six great grandchildren. She was stationed at a rural base made of portable buildings surrounded by farmland in Wales. “We had livestock wandering through the hospital grounds,” she said. Once she ran straight into a cow during a night duty. No lights were allowed on the base at night and only a small flashlight pointed at your feet could be used to move around, she said. She spent less than two years in the British Isles before coming back to the states to be discharged in January 1946. While overseas she saw the wreckage of London from Nazi bombing, and rode a French cruise ship refurbished as a military vessel since it had been left behind when Germany invaded France. Although she kept in contact with several nursing friends she made during the war, all of them have died. “There aren’t many of us left anymore,” she said.